Back in 2006, in a food trailer in South Austin, Torchy’s Tacos was born. 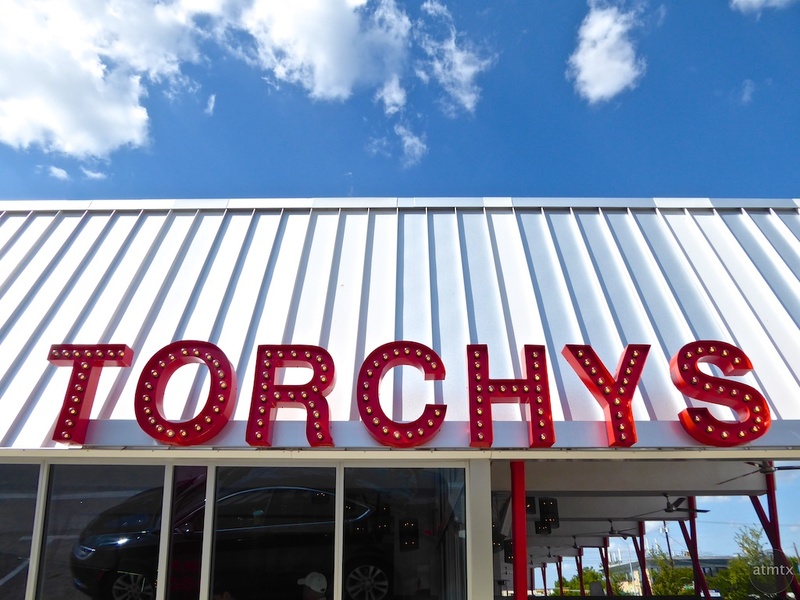 Now, Torchy’s seems to be everywhere and each incarnation seems to get a bit more distinctive. I was surprised to learn, via their website, that they have spread past Austin and into the rest of Texas and even beyond. There are now locations in Colorado and Oklahoma. I shot this at a new location on South Congress Avenue with my Panasonic ZS50. I love their graphic look and I think the red sign contrasts nicely agains the blue sky. Tell them we need them in New England. You can’t get anything even remotely Mexican around here that isn’t … well … horrible. I could understand that. When I lived in Pennsylvania, it wasn’t very promising either. Austin has a lot of Taco Restaurants. But would trade a few of those for a really good Philadelphia Cheesesteak. Sad but true, you really have to go to Philadelphia to find a genuine cheesesteak. The chain and franchised vendors hawking so-called “Philly Cheesesteaks” in airports and shopping malls must be guilty of some form of criminal behavior, even if only fraud. One question, Pat’s or Geno’s? I was always surprised how difficult it was to replicate a good cheesesteak and I agree that I haven’t found a good one outside Philadelphia. I’m convinced that the key is the bread. Philadelphia has terrible water but such wonderful bread. I wonder if there’s a connection?